Prince William, the third in line to the Throne, was close to tears earlier this week when the decision was made by Sir Richard Dannat that he will NOT be serving on the front line in Iraq with his Blues and Royals comrades. It has been a childhood dreams of his to fight for his country, and not be merely in the Army but stuck behind a desk. Prince Harry won't be going to Iraq after all. The Army top brass have decided that it's too dangerous to send a member of the Royal Family into the front line. 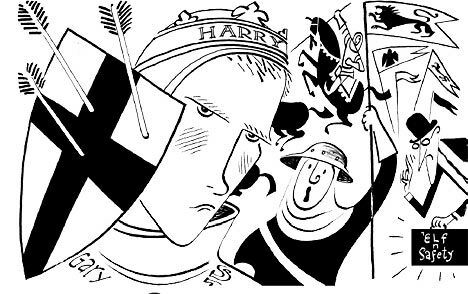 This got me wondering what might have happened if modern standards of risk assessment (and political correctness) had applied in the past - for instance, would an earlier Harry, Henry V, have been allowed to fight at Agincourt? Sir Richard Dannatt, our current head of the Army, plays the part of Henry's lieutenant. Once more unto the breach, dear friends, once more, Or close up the walls with our English dead. Excuse me, sire, could I have a word? But we are on the eve of battle, Dannatt. I must rally my men. That's not a helpful expression, my lord. Men, sire. It could be misinterpreted as a sexist remark. We have maidens serving these days. I know that, Dannatt. A comely wench brought me my mead this very morning. I was thinking of the lady archers, my liege. What, the fragrant Mary? I didn't know we had women in the King's forces. You must have read about that female sailor taken hostage when the Persians captured one of our galleons in the Gulf. Not so sure about fire, your highness. The battlefield has been declared a smoke-free zone. Enough, Dannatt. Now thrive the armourers, and honours thought, Reigns solely in the breast of every man. Don't interrupt. When the blast of war blows in our ears, Then imitate the action of the tiger, Stiffen the sinews, summon up the blood. . .
Forgive me, sire, but I've had elf 'n' safety on the trumpet about that breach. They've cordoned it off. Someone might get hurt. I am afeared there are few die well that die in a battle, For how can they charitably dispose of any thing when blood is in their argument? That's the problem, my lord. This business about closing up the walls with our English dead. If we are marked to die, we are enow To do our country loss. There you go, sire. We could be looking at millions of crowns in compensation. And then there are the rules on disposal of bodies. We're running out of landfill sites. If environmental services catch us closing up walls with our English dead, there'll be all hell to pay. Every subject's duty is the King's, But every subject's soul is his own. Not any more, my liege. Haven't you heard of corporate manslaughter? He which hath no stomach in this fight, Let him depart, his passport shall be made. I'm glad you said that, sire, your carriage awaits. It wouldn't be fair on the troops for you to remain. I have it on good authority that French militants have made thine capture a priority and are planning to cut off your ears. I can not flee the field, Dannatt. From this day to the ending of the world, We in it shall be remembered, We few, we happy few, we band of brothers. . .
Plus, there's no wheelchair access. For he today that sheds his blood with me. . .
Now there's another problem, my lord, we've got a bit of an issue with the transfusion service, something to do with HIV and dirty arrow heads. It's far too dangerous for you to stay here. 'Tis true that we are in great danger, The greater therefore should our courage be. All the more reason for you to withdraw, sire. Couldn't you do something else, like become a land mines ambassador? Must kings neglect, what private men enjoy? With respect, boss, we don't want you getting hurt. There have been specific threats. I'm sorry, Dannatt. I'm staying put. Gentlemen in England now a-bed shall think themselves accursed they were not here. If not for yourself, sire, think of your men. While you remain they are all a target for the French insurgents. Would I were in an alehouse in London. I would give all my fame for a pot of ale, and safety. It could be arranged, sire. Out of the question, Dannatt. I see them standing like greyhounds in the slips, Straining upon the start. It's not too late, my lord. We can have you back in London on the evening tide. Don't you think that's a bit racist, sire? I'm not sure that will go down too well with the Saracen and Moor communities in Bradford, Leicester and east London. 'Fraid not, my lord. The Mayor of London has abolished St Crispin's Day in the name of diversity. Then shall our names, familiar in his mouth as household words. . . Sorry, sire, it's now a criminal offence to read out the names of war dead. What infamy. They shall hold their manhoods cheap while any speaks that fought with us. I beseech you, withdraw now. The joint chiefs believe your very presence poses an unacceptable risk. They're keeping your seat warm in Boujis. 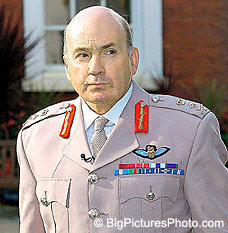 Impossible, Dannatt. I fear 'a little touch of Harry in the nightclub' just doesn't have the same ring to it. Last edited by Blackleaf; May 18th, 2007 at 01:51 PM.. Anybody still use rabbit ears or rooftop antennas?